There's nothing cool about automotive accidents or cars meeting unfortunate fates in junk yards, but there's something incredibly fascinating about these old black and white photographs taken in the '20s and '30s of wrecked automobiles. Leslie Jones, who passed away in 1967, captured tons of car crashes, leaving you to reimagine the sad tales of what really happened to the contorted heaps of metal. Flavorwire and A Continuous Lean tipped us off to the Leslie Jones Collection that is housed in the Boston Public Library. We searched through every one and picked out the very best. The titles you see below the pictures were found on the actual negatives or negative sleeves. 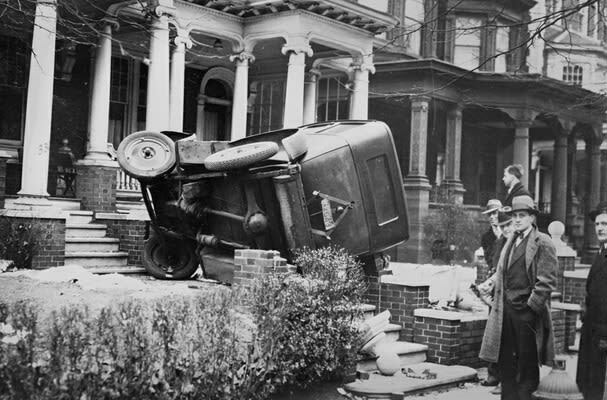 Click on to see 25 Vintage Photos of Car Accidents.